Are you not sure whether you really need a professional translation or what translation services involve? On this page you will find some answers to frequently asked questions. Can’t find your question? Then please write to me and I will happily reply to you in detail. Our texts contain sensitive company information. Will this information be secure with you? 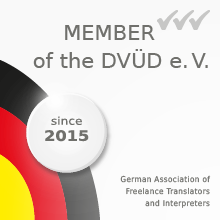 In accordance with Section 2.6 of the Professional Code of Conduct of the German Federal Association of Interpreters and Translators e. V., translators are required to treat information received within an order as strictly confidential, including after completion of the order. I adhere to this principle and would be happy to sign a non-disclosure agreement at request. Interpreters and translators belong to two very different professions. While interpreters render texts or discussions into another language orally, translators are tasked with converting a text into another language in writing. As a translator, I am dedicated to translating written texts and therefore do not offer interpreting services. Nevertheless, I would be happy to assist you in sourcing a competent interpreter for your project. Will my translation be proofread? I meticulously check every translation for potential errors before I send it to you as a matter of course. If you require additional assurance for particularly important translations, I can offer you proofreading by a second translator in accordance with the four eyes principle at request for an additional charge. Is a translation not always worse than the original? Not at all! A good translation is at least as good as the source text. It even gives you the chance to correct errors in the original and adapt the text to the target audience so that it resonates well with the German culture. With a good professional translation, you cannot tell that the text had previously been written in another language – regardless of whether it is a technical text, advertising material or literature. Nowadays, everyone can speak English and there is always machine translation. Why should I have my website translated professionally? A good translation makes a huge difference. Imagine that you are online searching for a hotel in a country where you do not speak the language. Would you choose a hotel that only has a website in English (which might not be your mother tongue) or that has been machine translated, or a hotel that has a website that welcomes you with perfect and clear formulations in your mother tongue? Translations build trust and ensure transparency, since it is important that your customer does not worry that he/she may have misunderstood something. Although machine translations are a useful way to get a rough overview of the content of a text, they are never free from error and can even contain obvious mistranslations, leading to resultant problems and misunderstandings. A translator always keeps the future reader in mind, whereas a machine is not able to. A professional translation helps you ensure that your text is precisely targeted at the people you wish to address, using the words that will resonate well with them. Another point is search engine optimisation; machine translated or incomprehensibly translated websites score badly in the Google ranking, with the result that your website has less reach. I make sure that your website includes the correct search terms in German.